The experiment was performed on the XGIII facility. The picture shows a young scientist installing the equipment in the chamber. In 1901, Wilhelm Röntgen received the first Nobel Prize in Physics for his discovery of X-rays. Nowadays, X-ray has been commonly used in medical, industrial detection, security inspection, scientific research, etc. 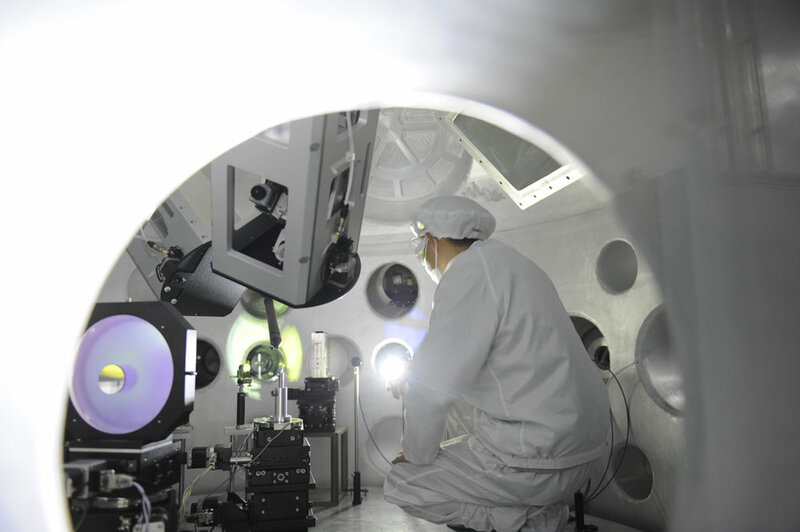 Recently, with the development of TW or PW laser facility, ultrafast X-ray sources based on laser-plasma interaction (Kα X-ray source, γ-ray source and so on) begin to be applied. High quality energetic electrons are required for all the sources mentioned above. Unfortunately, the divergence angle of the electron beam is too large to produce Kα X-ray and γ-ray source. Therefore, how to reduce the divergence angle of electron beams has been a problem. It is reported by some research groups that high energy electron beams with small divergence angle can be obtained through laser-metal wire interaction. The generated electrons move forward along the wire, which generates a cold electron return current inside the wire to overcome the Alvén limit. Correspondingly, a quasi-static electromagnetic field is built on the surface of the wire. Under the effects of both electric force and magnetic force, an electron beam with small divergence angle can be achieved. However, the total number of the controlled electrons is restricted by the single wire structure and the brightness of the source is also limited.It is reported by some research groups that high energy electron beams with small divergence angle can be obtained through laser-metal wire interaction. The generated electrons move forward along the wire, which generates a cold electron return current inside the wire to overcome the Alvén limit. Correspondingly, a quasi-static electromagnetic field is built on the surface of the wire. Under the effects of both electric force and magnetic force, an electron beam with small divergence angle can be achieved. However, the total number of the controlled electrons is restricted by the single wire structure and the brightness of the source is also limited. Researchers in Prof. Yuqiu Gu's group, from Research center of Laser Fusion, China Academy of Engineering Physics, proposed a more efficient Kα X-ray source with metal nanowire target. The multiple nanowire structure helps generate high energy electrons with a smaller divergence angle, which makes it possible to produce a micro-focused X-ray source. It has great potential to be applied in the dynamical shock wave imaging field. It is reported in Chinese Optics Letters Vol.13, No.3, 2015. Many research groups found that the single wire target could greatly reduce the spot size of the X-ray, but the yield from the wire target would be much lower than that from the planar target. However, small spot size can be achieved with the nanowire target while a high yield can be guaranteed. Therefore, these sources which generated from the laser-nanowire interaction are suitable for diagnosing high-compressed matter, lattice dynamics response, and so on. In this research, micro-nano materials are used in the X-ray generation. Utilizing the surface electrical field on the nanowire, fast electrons are controlled then a compact spot source is produced. Prof. Gu concludes that the results of this research pave a new way to generate compact spot X-ray source. Micro-nano material may even be used in the fast ignition in the future. Following works will be focused on promoting the efficiency and monochromatization of the source.